With Memorial Day Weekend traffic in full swing, we decided to leave Brooklyn around 7:30pm on Friday night so Sally could sleep in the car and we could drive up north in peace. Since it's such a long drive up to Lake Placid (5 hours), we had planned to stop for the night at a nice midway point – one of our other favorite places to stay, Carl's Rip Van Winkle Motor Lodge. 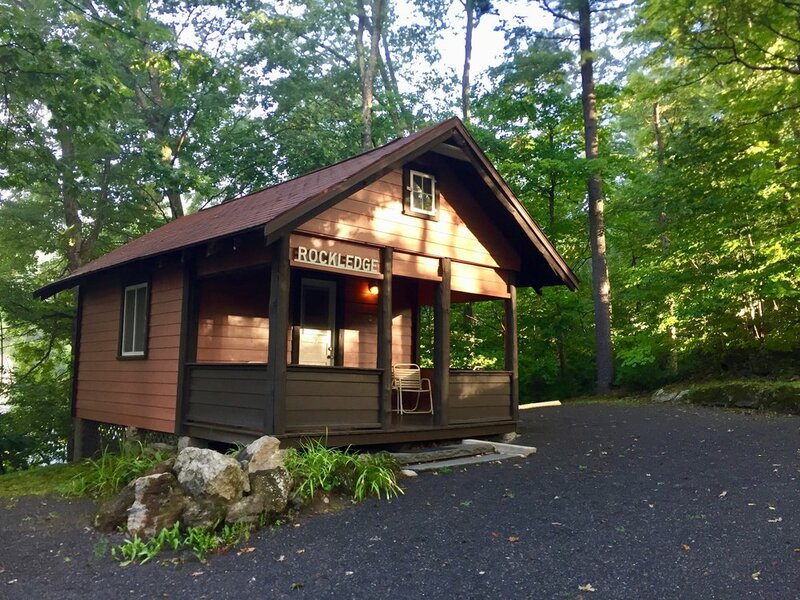 It was a short overnight stay in a familiar cabin with a closed-in porch (which with a now 2-year-old was key so she could be on the porch without us having to worry she'd take off running at any given point). Then it was back on the road! A true delight we discovered just up the road from Rip Van Winks was a new restaurant called Gracie's Luncheonette. Not only did they have great views of the Catskill Creek, but the food was BEYOND! Alan and I both got fried chicken sandwiches and loved them so much, we talked about wanting to stop and eat here again on the drive home because there were so many other options we wanted to try. Gracie's started out as a food truck and more recently expanded into the brick-and-mortar world. It services all the classics you'd want from a diner, but with much higher quality, locally-sourced food. You won't be disappointed, and it's not far at all off of Route 87! After driving a few more hours, we arrived at Whiteface Lodge, and once we got there just seeing all the amenities (from their homemade chocolate chip cookies to their 3 different hot tubs) had me already wishing we were staying longer. One random amenity that seems to always be happening when were are there but somehow we've never done, is a caricature artist. Super cheesy, right... or super AWESOME! A caricature portraits was always one of those things I DESPERATELY wanted as a kid walking down a beach boardwalk, but my mom always said that they were overpriced and I didn't need one. It's true, I didn't need one, but that didn't stop me from wanting one. On holiday weekends, Whiteface has a gentleman that comes and offers FREE (!!!) caricatures. We were quick to sign up this time (this is key as the sign up sheets gets booked up within about a half hour of his arrival) and got our caricatures done and let me just say, it was worth the wait. I just loved it! BOATING! While Whiteface Lodge is not directly on a lake, about a mile down the road they have their own private beach (with a complimentary shuttle). At the boat house you can grab a kayak, canoe, or rowboat and head out onto Lake Placid. All of these are complimentary with your stay! (They do have larger boat options that you can rent out including a pontoon boat and a super fancy-looking wood one that reminds me of George Clooney on the waters of Lake Como.) We opted for a canoe and Sally actually stayed awake during the boat ride this time (normally the gentle rocking of any boat puts her right to sleep). QUICK TIP – Whenever we know we are going on any sort of boat ride, we bring Sally's Puddle Jumper (floaty pool thing) since we know it's comfortable for her, familiar, and she doesn't have to wear whatever ill-fitting life jacket the boating place has. They also have a small beach there where you can swim, a basketball hoop, some other sporting stuff (I'm not well versed in sports), and a bar! Best of all, Sally met the sweetest 10-year-old boy at the beach. She helped him find rocks and he helped her collect leaves and they soon became fast friends! S'MORES! Each night at the Lodge, they make a fire on the grounds and put out all the components for you to make s'mores. Sally has strangely been super into marshmallows this summer, so she was particularly game. I don't love the mess of s'mores, so I just snuck the Hershey's chocolate while Alan helped Sally do her roasting. And sure enough, the adorable 10-year-old boy from the lake was there! He also took a hand at helping Sally with her s'mores and then entertaining her and about four other little kids on the lawn with a game of red light/green light. Around the fire, I chatted up a few other families with kids, and it seems like Whiteface has a number of loyal guests that come back each year. I'm hoping as Sally gets older we see some of the same families year after year. One more note about Whiteface Lodge for families is that they provide a day camp for kids, Camp Kanu, that also comes free with your stay for kids ages 3 to 10. Looking on from a distance it didn't appear particularly structured, but the kids there were running around playing together nicely and didn't seem in any danger, so, uh, free babysitting?? We'll take it!!! ...next year when Sally's 3! During this year's stay, we thought about taking a hike, but Sally is not the best hiking buddy at 2 years old. She walks very slowly or runs away from us before inevitably whining to be picked up and carried. Fine for a short walk around a lake, but not so great for a hike up a mountain. So looking for something fun to do, we discovered not one but two wildlife sanctuary type things. The Wild Center is not far from Lake Placid, in Tupper Lake. It has plenty to do inside as a solid option if the weather is hit or miss, but it has some awesome outdoor adventures for kids and adults. Indoors, you can learn about regional plants and animals, watch an IMAX film (if it's not actually IMAX, it's that type of thing), or, my personal favorite, check out the naturalist's cabinet. It's a beautiful room filled with fun-colored mushrooms, a taxidermied sweet baby fawn, and treasures in the drawers that you and pull out to play with. Outside, the main activity is the Wild Walk. It's a series of trails raised up so that you are walking along the treetops. The "trails" lead you to different special zones, such as a massive birds nest you can stand in with great views, a HUGE spiders web made of ropes that you can climb on, suspension bridges that take you to towers. It's hard to explain, but trust me, go check it out with your kids, it's a truly fun and unique experience! It's also accessible to strollers, which is another bonus for me! While back at the hotel, I was talking with one of the staff about our day at the Wild Center and he told me about another wildlife experience not far from Lake Place called the Adirondack Wildlife Refuge with rescued wolves and foxes. That was good enough for me! So we decided to check it out on our way out of town, and it was great too! There, you walk around the property meeting various rescued animals (on the other side of the cages of course). And there were plenty more animals than just beautiful wolves and foxes. There were bears for one thing. And various eagles, owls, and other birds that were injured and brought there to be cared for. We also saw a porcupine walking upside down on the roof of his cage and a red fox taking a nap in a camping chair. The owner and founder of the park is incredible passionate about wolves and knows (what seems like) everything about them. In front of the wolf pen, he gave us and a handful of other guests a fascinating history of the domestic dog and how we got there from the wolf. Probably more stuff too, but it was about then when I had to chase down Sally who decided to run off towards the bear cage. Good stuff. Anyway, it's a great experience that I recommend and always nice to support an enterprise that is taking care of injured/disabled wildlife in the area. These actives were great for Sally's age and I imagine older. I can't wait to see what we find next year!